PARTICIPATION OF THE SOCIETY OF PREVENTIVE PSYCHIATRY SPP AT THE PANHELLENIC PSYCHIATRIC CONGRESS 2018 AND AT THE MEETING OF MEMBERS AND FRIENDS OF THE SCIENTIFIC COMMITTEE OF THE EPIONI ASSOCIATION | SOCIETY OF PREVENTIVE PSYCHIATRY - WFMH, WASP MEMBER AND WPA AFFILIATE MEMBER. ΕΤΑΙΡΕΙΑ ΠΡΟΛΗΠΤΙΚΗΣ ΨΥΧΙΑΤΡΙΚΗΣ - WFMH, WASP ΜΕΛΟΣ ΚΑΙ WPA ΣΥΝΔΕΔΕΜΕΝΟ ΜΕΛΟΣ. 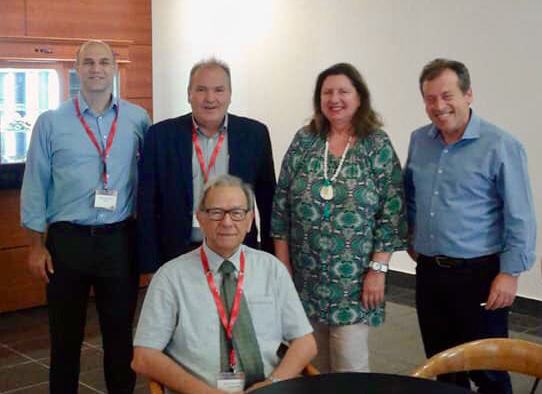 In the photo are pictured psychiatrists Fotis Morogiannis, Orestis Giotakos, Nikos Christodoulou, doctor Kelly Panayotopoulos and the President of the Society of Preventive Psychiatry Professor George Christodoulou.